Our milking parlour is equipped with the latest technology to ensure first class standards in all aspects of hygiene. We have a direct link from our parlour pumping fresh milk to our cheesemaking facility. When the milk is warm, we add a bacterial culture dissolved in a bowl of milk to start the cheesemaking process. The culture also helps the cheese’s flavour develop as the cheese ages. After heating the milk further, we add in an enzyme called rennet. This enzyme thickens or ‘coagulates’ the milk. The milk will turn to a firm consistency within about 25 minutes. The coagulated milk is cut into half-inch cubes with wire knives. In the process, 90% of it separates out as watery whey. Solid curds remain, and this is essentially cheese, though soft and tasteless. To firm up the curds further, they are then stirred and heated again in the whey. The curds and whey are drained from the cheese vat to the draining table. The whey is then drained in to our underground tank for later use as fertilizer on our fields. Meanwhile, the curds are raked to side of draining table. The curds form together into slabs and the slabs are then stacked and re-stacked. The cheese curds are then scooped into special moulds, before being pressed. The resulting wheels of cheese weigh approximately 2.5kg after maturation. Knockanore Cheese is then matured for a minimum of six months. After maturation the cheeses are cut in to wedges ready for dispatch to our customers, or left whole for our restaurant customers or for sale at cheese counters. Our famous smoked Knockanore starts its life the same way as our Vintage White Cheddar. At around four months of age, we select the ideal wheels for smoking. We then cold oak smoke the wheels of cheese for ten days over oak, using our traditional purpose built kiln. The oak which we use is sourced locally from the neighbouring town of Lismore. The wheels are then further aged on-site for a minimum of two months, so that our smoked cheese has a total maturation time of around six to eight months. 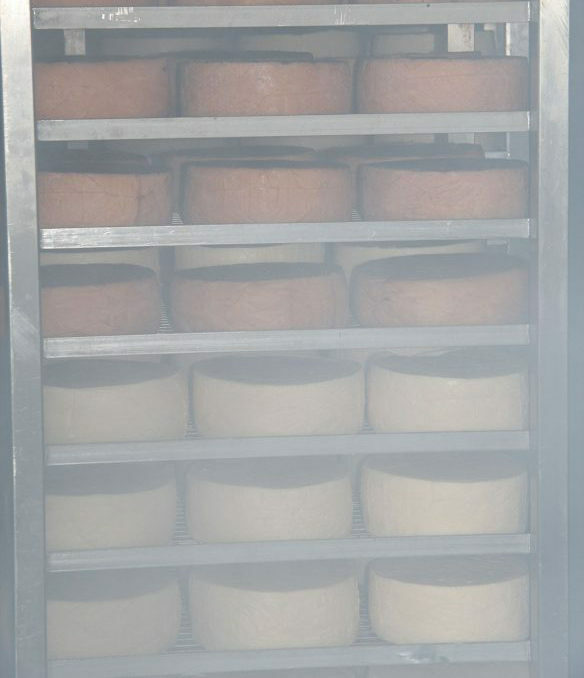 We pride ourselves on the fact that we smoke our own cheese on site, using traditional methods and a natural process. This contrasts with our more commercial counterparts who use flavourings and colourings in an effort to achieve a similar result. Trade customers or those of you interested to learn more about our systems and accreditation can visit our trade section.